A village named Lundby served as the cradle and the namesake for a very successful dollhouse company. Lundby of Sweden was established after World War II by Axel and Grete Thomsen in the northern part of Gothenburg. The company later designated 1947 as its official start-up year. Grete was very clever at designing dollhouse furniture for her niece (the first piece she made was an armchair, upholstered with a colorful scrap of curtain material and stuffed with wadding), so her husband, Axel, decided to try selling the furniture. The department store, Ferdinand Lundquist (later NK), in Gothenburg was the first to place an order of 350 SEK. 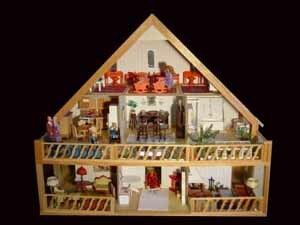 The demand for Lundby dollhouse furniture increased, and in 1948 the Thomsens moved their fledgling company from their basement in the village of Lundby further north to Lerum for expansion. Business flourished, although in the summer of 1950 the company was almost completely destroyed by fire. The most important papers survived, orders could be completed, and production continued at various temporary places in Lerum until a new factory could be built. 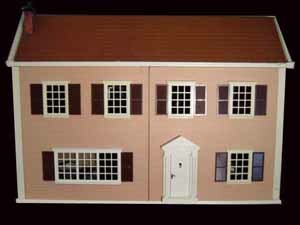 The range of products also increased to include a dollhouse, which was produced in the same scale (1:15 to 1:18) that is still used today. When another fire in 1959 burnt out the nearby Lerro factory, owned by a well-known Swedish house interior designer, Per Börnfelt, the Thomsens offered him a partnership. Börnfelt accepted the proposal and designed for Lundby until his retirement. 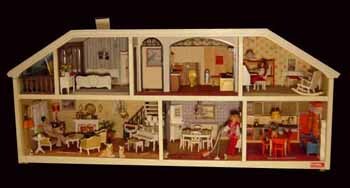 In 1967, 35,000 dollhouses were produced in Lerum. 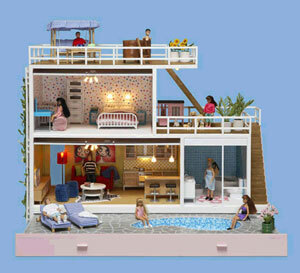 From that time onward, the fame of Lundby dollhouses spread throughout Europe and even worldwide. 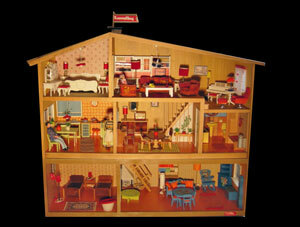 By the 1970s Lundby was producing in 11 countries and exporting dollhouses and furniture to 20 countries. Just ten years later, they were manufacturing 100,000 dollhouses a year. Dark clouds were approaching on the horizon, however, in the form of electronic toys, which appeared on the market in the late 1970s. As Lundby continued to expand globally during the 1980s, more production was moved abroad. Lundby experienced its first crisis in 1982, when the company suffered from overexpansion. Businessman Stefan Karlsten purchased Lundby that year and moved the company’s production facilities in Hong Kong back to Lerum. Even though the firm recovered slightly, Lundby experienced its first bankruptcy in 1983. With the help of a heavy input of capital from the Swedish government, Lundby started up again in 1984 and reestablished its factory in Olslanda, also outside Gothenburg. It was during the 1980s that Lundby made its greatest expansion when the company acquired the British firm, A. Barton Toys, Lisa of Denmark, and Plasty GmbH, a German firm that marketed the Petra line. 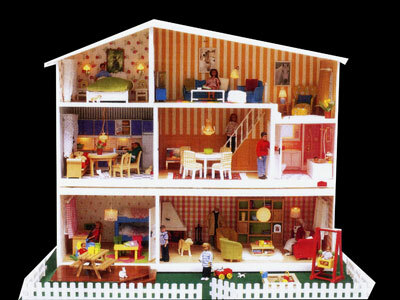 Many new dollhouse variations, furniture, dolls, and accessories were introduced during the decade of the 1980s. The good times didn’t last, unfortunately, and the company faced further financial difficulties. By 1993 Lundby was acquired by the Scanbox Danmark Group, a Danish company. Between 1994 and 1997,Scanditoy, a subsidiary company of BRIO®, distributed Lundby products worldwide. Before Lundby folded, however, the museum in Vänersborg succeeded in buying a set of dollhouses from the entire producing period for a symbolic amount of SEK 1.250 or USD156! Finally, in 1997 Micki Leksaker A/B purchased the rights to produce Lundby. Two years later in 1999, Micki introduced a fresh, exciting line of Lundby, including the Gothenburg dollhouse and a complete line of furniture. 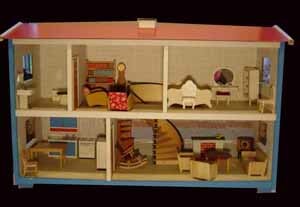 In 2005 Micki designers offered the first new Lundby dollhouse in over 15 years with the newly designed “2005 Stockholm.” In 2006 the firm kept the original 1960s asymmetrical design of the Gothenburg dollhouse, but renamed it the Småland. Keeping abreast of innovative and exciting products, in 2008 Micki introduced a visionary Lundby "Doll Cottage" named the Gotland. The house, furniture, and accessories were designed by the Swedish architects, Ann Morsing and Beban Nord of Box Design, who also created the 2005 Stockholm house for Lundby. The above information was compiled by Sue Morse from various articles and Lundby promotional pieces.